The haggard or careworn sailor was wild and tired in appearance, with great dark circles under his eyes. His haggard and exhausted body showed years of hard labor in the wind and rain, which had carved many wrinkles into his old looking face. I could hardly believe it when I discovered that this haggard and wasted man was not yet 30 years of age. Quiz: Try again! What is a haggard appearance? It is lean, drawn, and worn down. It is pale from fright. Hagrid's Imprisonment When Hagrid was put into Azkaban he became very haggard in appearance. 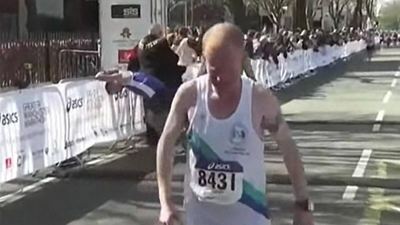 YouTube: Online News Bank These finishers of the Manchester Marathon are haggard.